In the spirit of renewal spreading in the after cholera time, and driven by the housing situation , a committee examined the possibility of immediate realization of projects for the remediation of areas, such as St.Brigida district, close to the Royal Palace. The buildings had a dignified look, but you could not say the same for the interiors, in the streets crossing the center towered dilapidated buildings in the height of six floors. There were also buildings of particular architectural interest such as the Church of St. Brigida and the one of St. Ferdinand . In the four projects examined by the government for the restoration, it was common the need to improve the view to the San Carlo (St. Charels) Theater. Engineer Alfredo Cottrau in the name of morality and hygiene , proposed restructuring the entire area, the project involved the demolition of the church of St. Ferdinand which according to the engineer, was an obstacle to the expansion of the theater. The proposal aroused much criticism and failed. Engineer Emanuele Rocco presented a project that involved the construction of four large buildings managed by a large gallery of iron and glass of 1076 square meters. The four arms of different length, intersecting, gave rise to an octagonal cross covered by a wide dome. The most important buildings are still preserved, as well as an exedra colonnade near the St. Charles Theatre, that would create an open space in front of the theatre, allowing a greater visibility . 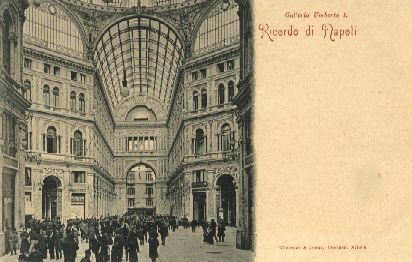 During the execution phase there were several changes, the work proceeded speedily and in 1892 the mayor Nicola Amore inaugurated the Umberto I Gallery, and for that occasion an exhibition of artistic handworkers and industrial products was held. The construction speed is to be put in relation with the great possibilities of earnings this area promised, being an important commercial spot. Furthermore, reasons of prestige and decorum pushed the city authorities to a record time realization, as proof of their administrative ability. The Gallery became a symbol of the bourgeois class in opposition to the urban landscape surroundings, which lived a strong architectural emergency. For a long time the Gallery was the living center of the cultural and commercial town, satisfying the function for which it was intended . Naples image during the second Bourbon restoration is certainly disappointing. Ferdinand tried to adopt a conciliatory policy towards the bourgeoisie, accommodating the political and social rise with the purpose of putting an end to the strong isolation which hit the Bourbon Dynasty. But it did not happen so, and shortly the first revolutionary movements burst, when at first the province and than the town center were protagonists. The short Ferdinand I’s reign, shaped on neutrality, could not solve the environment degradation problems plaguing ancient Naples. An image about Naples asleep in the restoration is given by Stendahl in his work “Rome, Naples, Florence” telling the conditions in which Naples lived and expressing at the best the appeal spread by the city on that author. Ferdinand II ascended the throne when he was just twenty in 1830 and he tried to discuss the relations with political men and intellectuals who found a rather good support during that cultural growth. Naples became a good social life center with many theatres appearing operative. Many exiles, escaped from the Bourbon repression, returned and among those there was Antonio Ranieri who described the political and cultural life in the capital by his work “State of literature in Naples and Sicily”(1883). Many cultural magazines flourished having the aim of educating the population to homeland love. The most successful magazine was “Il Progresso” by Giuseppe Ricciardi. G. Ricciardi believed progress at the base of historicism starting the behavior which makes us think today is better than yesterday. Many critic opinions were started by Leopardi who thought progress not good for man, as man is only seeking happiness. In addition we have some memories production by the protagonists of Risorgimento, witnesses suffering in Bourbon jails, among whom was Guglielmo Pepe accusing in his work “Memories – 1848” the heavy Bourbon repression. Luigi Settembrini, by his work “Memories from my life” – 1879, an autobiography, describes the repression hitting many intellectuals, and the bourbon motto: teaching = conspiring, as the Bourbons well understood the dangerous action of intellectuals. In spite of many signals about cultural growth and new public renovating works, unemployment and overpopulation weighed on the kingdom. Between 1836-1837 there was a large cholera crisis. In 1859-50 Francis II ascended the throne. It was the year of the One thousand expedition and the arrival of Garibaldi in The Two Sicilys Kingdom with the aim of conquering it in the name of Victor Emanuel. By the annexation to the Kingdom of Savoy and Victor Emanuel as King, the town tuned its page. Giacomo Leopardi stayed in Naples from 1833 to 1837, not only because of his health needs but also because of his great friendship with Antonio Ranieri. Already in 1827-1828 in Florence Leopardi tasted the pleasure of “Neapolitan conversation” thanks to his visiting some Naples artists. In Florence, Alessandro Poerio introduced Leopardi to Antonio Ranieri. Between the two young men a great friendship developed which brought them to spend five months together in Rome in 1830. In 1832 Ranieri went back to Naples, his birth place, and between the two men a frequent correspondence started. On october 2nd 1832 Leopardi reached Ranieri in Naples hoping the mild climate in town would be positive for his health. 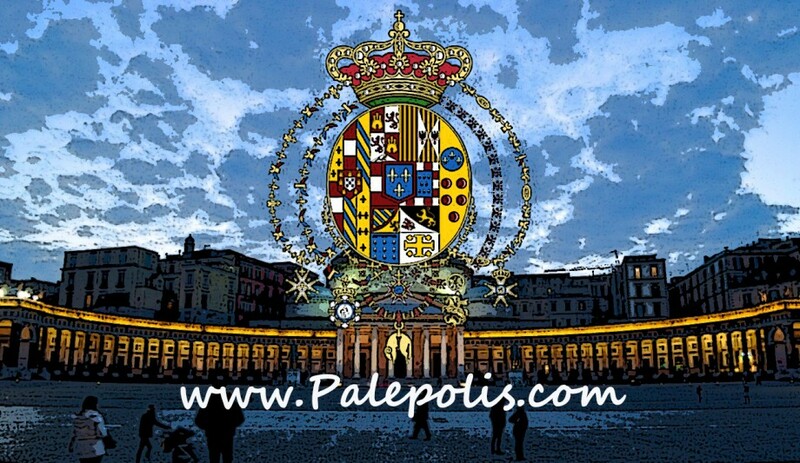 Both lived in Via San Mattia n° 88 on the second floor of Palace Berio near San Ferdinando Square. During the days following his arrival, Leopardi wrote e short letter to his father: “… I arrived here luckily, namely without damage and misfortune. My health furthermore isn’t a big deal and my eyes are always in the same state. The climate mildness, the town amenities and the lovable, good hearted character of the citizens give me a pleasant feeling.” Such an enthusiasm came soon to an end because of the not quite idyllic relations with the neapolitan intellectuals, who didn’t loose any occasion to mock him and call him “o’ ranavuottolo” (a little frog) each time when they saw him sitting at the table in coffee shop “Two Sicilies” regularly visited by Leopardi. Two months later Leopardi and Ranieri moved to Via S. Maria Ogni Bene n°35, in district Vomero where the best air in Naples could be breathed. On the eve of the house moving his “Operette morali” (Moral Works) were confiscated. During the years spent in Naples, Leopardi busied himself with the writing of his “Pensieri” (Thoughts), but shortly Leopardi’s health conditions got worse and, when in Naples a cholera epidemic exploded, Leopardi moved with Ranieri to the Villa Ferrigni in Torre del Greco, where he stayed from summer in that year till February 1837. During his Vesuvian stay Leopardi worked about his poem “The broom or desert flower”, one of his most famous lyrics, where he expresses his clinging to life and and judges nature a tyrant. In 1837 he went back to Naples with Ranieri, but his health conditions got worse and on June 14th in that year he suddenly died, after feeling sick at the end of a meal. 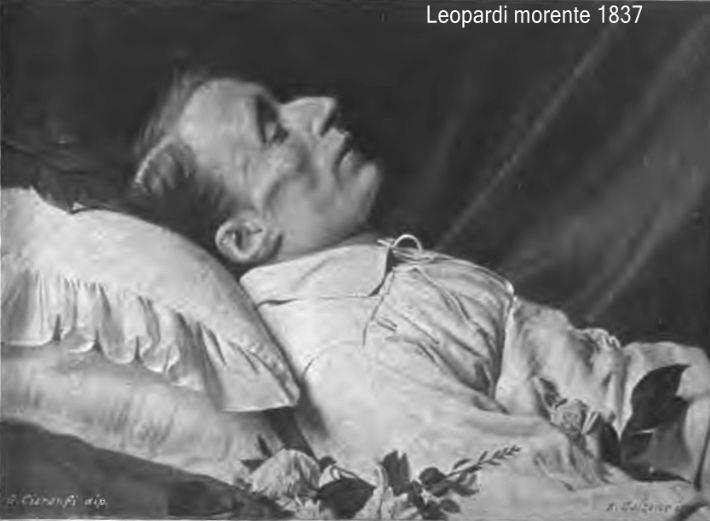 According to the witness of Antonio Ranieri, Leopardi died at 9 p.m. in Antonio’s arms and his last words were: “Farewell, Totonno, I don’t see light any longer”. Thereafter Ranieri published an add about Leopard’s death on the newspaper “Il Progresso”. 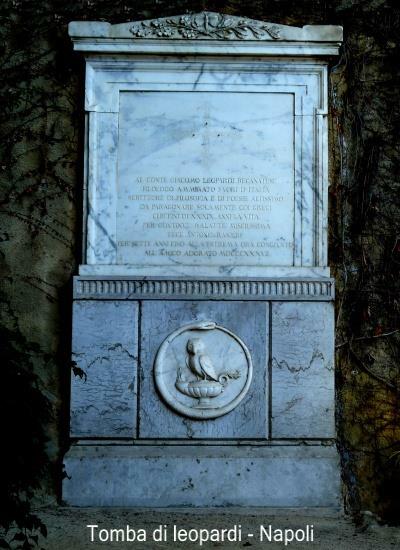 Leopardi died in the age of 39 years, at a time when cholera was hitting Naples downtown. Thanks to Ranieri who involved the Police Minister, Leopardi’s corpse was not thrown in a common grave, as requested by the severe laws at cholera time, but buried in the hall at San Vitale Church in Fuorigrotta. In 1939 his remains were moved to the Virgil Park in Piedigrotta – named Park of the Virgil tomb, in the district Mergellina, and the place was declared a national monument.